A federal judge in Texas has issued a nationwide injunction blocking the US Department of Labor’s (US-DOL) new overtime rule. The injunction halts enforcement of the rule until the case is decided. The regulation had been scheduled to take effect on December 1, 2016. It would raise the salary limit under which workers automatically qualify for overtime pay to $47,476 from $23,660. In addition, the salary threshold would be tied to the 40th percentile for full-time salaried workers in the lowest income Census region (currently the south) and updated every three years. So what does this mean for employers? The overtime rules will *not* go into effect on December 1, but employers should be aware that the regulations could still be implemented at a later date. Until a decision is reached, employers should continue to follow the existing overtime regulations. WorkLiveUP.com promotes Upper Peninsula companies and workforce. HOUGHTON, Michigan (October 27, 2016) – Two innovative companies in Michigan’s Upper Peninsula are coming together to tackle a longstanding economic challenge for the region: attracting workforce talent. Upper Peninsula Marketing Department, Inc. (MDI) of Houghton and Stang Decision Systems (SDS) of Marquette launched WorkLiveUP.com, an online job board designed to connect U.P. employers with job seekers from the U.P. and beyond. The website will be heavily advertised within the region and targeted to people across the country with connections to the U.P. WorkLiveUP.com allows job seekers to view and apply for an unlimited number of openings. Employers may also post as many job listings as they wish for free. Additional paid tiers of service for employers offer a range of benefits, including rankings of job seekers through Stang’s HireScore Talent Portal, postings to 100+ national job boards, workplace cultural audits, digital and social media job promotion, targeted advertising opportunities, and more. Due in part to its relative geographical isolation, Michigan’s Upper Peninsula has traditionally faced significant challenges in drawing talent. MDI CEO Karyn Olsson believes it is also due to misconceptions about the area. “We have incredible resources and awesome companies in the U.P. We have some of the best public schools in the state and several top-notch universities. We have a wide variety of industries based here, including some truly leading-edge technology firms. And of course, it’s one of the most beautiful places in the country to live and work.” The site will feature job openings, but it will also promote the benefits of living in the U.P. Keeping the site current and efficient is a top priority. Upper Peninsula Marketing Department, Inc. is the U.P.’s leading marketing and design firm, with clients in technology, manufacturing, and banking. With extensive experience that includes marketing and brand strategy, advertising, and public relations, MDI is committed to helping the region’s extraordinary talent shine. Stang Decision Systems is a pace-setting talent analytics firm dedicated to helping its clients and partners make the best possible hiring decisions and developing employees. SDS aims to help companies hire better, faster, and smarter, thereby increasing employee job performance and decreasing turnover. This article appeared originally on https://www.marketingdepartmentinc.com/real-plan-leads-real-success-strategic-planning-part-2/. My number one rule in strategic planning and marketing is – NEVER MAKE ASSUMPTIONS. The process of research and discovery will illuminate assumptions and give you the confidence and exact direction to develop SMART (Specific, Measurable, Attainable, Realistic, and Timely) strategies. There are four components in the first step of research. What other products and services your customers are seeking that you can provide. You can achieve this easily with a customer survey with questions that inquire about price, product, access and service. This survey should ask 5–7 questions and take no longer 4–5 minutes to complete. If you have never designed a survey, consult with someone who knows how to design questions optimally.Survey Monkey also has great resources to help you design questions. Industry / competitive audit – Your next step is to learn how competitors deliver products and services and understand where you are positioned in that group. If you’re a B2C business, you should research your top ten competitors. If you’re a B2B company, analyze your top five competitors. 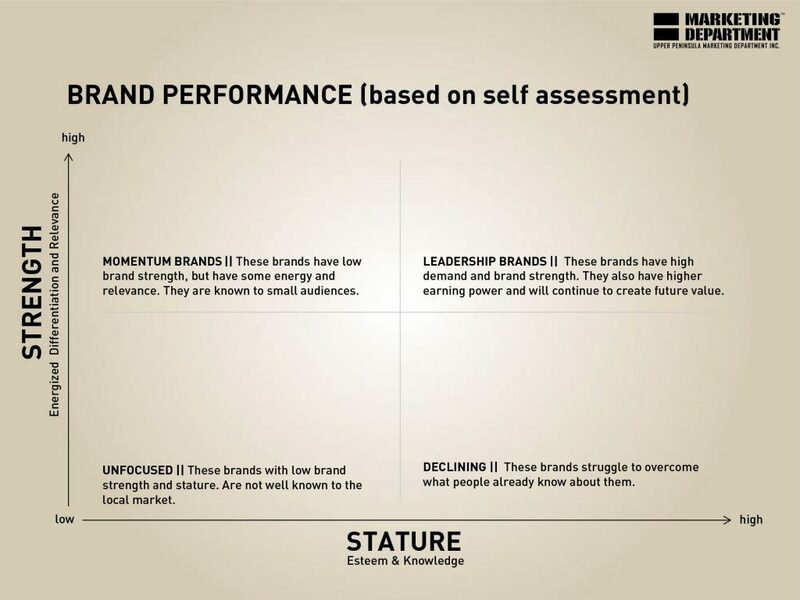 Document their strengths, weaknesses, pricing, product mix, brand promises, and successes. Learn all you can about your competition by taking a close look at their websites and reading online reviews. I also like to take management groups through an exercise that visualizes where the company stands against its competitors with price and quality. Here is an example of a matrix you can use in your group. Employee Happiness Survey – In addition to your profit and loss statement, another great measure of how well a company is performing is how happy employees feel. I will be writing an article later this year on this specific subject. Meanwhile, here is Gallup’s Q12, a very well-researched set of questions that work in any organization. Management SWOT session – I know what you’re thinking: “We’ve done this several times and get nothing out of it.” I promise you much different outcomes if you have conducted the above steps and shared them with your managers. Defining the strengths, weaknesses, opportunities and threats of your business will reveal your internal and external marketing priorities. It’s time to establish goals and set priorities. At this point you will have gathered data and are no longer working on assumptions. You will be 110% confident and know precisely what the strategic priorities need to be for the next 12, 24 and 36 months. Now, organizing those ideas is key. My number one piece of advice here is that the plan needs to be simple and straightforward. Don’t worry about language – just get started. Now you can be confident that you have a research-driven strategic plan for your company. Make sure to hold people accountable for each strategy and meet every month to see where managers are on their goals. Support the managers by making sure they have the tools and resources they need to implement the plan. I wish you the best of luck and welcome calls on this subject any time. 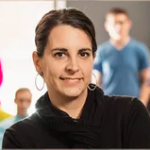 Karyn Olson is the CEO and Chief Strategist of the Upper Peninsula Marketing Department, Inc. You can see her company’s work at https://www.marketingdepartmentinc.com/. This article appeared originally on https://www.stangds.com/blog/hows-fit-selection-process-resulting-good-hires/. As I’ve talked about in a previous blog post, a primary goal that drives our work at SDS is to achieve a 90%+ selection process accuracy rate. In other words, we want more than 90% of the people who are hired through our tools to be considered “good” hires. What types of information do we use to determine whether or not someone was a “good” hire? Whose input do we consider to be the most useful? The answers to these questions are critical factors which help us when determining if our selection process is resulting in “good” hires. I’m going to focus this blog on explaining some of the most critical factors we consider when collecting performance ratings. When supervisors are asked to make evaluations on their people, the context in which these ratings are gathered can dramatically influence the true accuracy of the evaluations. For example, if a supervisor is asked to make evaluations that will be used to determine pay and promotion, the supervisor may rate someone differently than if they were evaluating a candidate for purposes of determining future training. In either of these cases, there are motivations that affect how a supervisor evaluates their subordinates that may have little to do with making precise, accurate evaluations. These motivations may include factors such as maintaining the morale of the supervisor’s team, motivating people to improve in the future, or ensuring subordinates receive pay increases. Because of these motivations, we prefer to not use ratings obtained within an organization’s performance appraisal system. Instead, we prefer to collect our own ratings with a survey that is ONLY used for purposes of evaluating the selection process. We let evaluators know that their ratings of each individual will not be seen within the organization, and will be used for research purposes only…which ultimately leads to continuous improvement in their selection process. By doing this, it allows supervisors to focus on making accurate evaluations of their people without having to worry about the implications of these ratings. For many jobs, people are evaluated by objective criteria, at least in part. For example, a production worker in an assembly plant may be evaluated by number of products assembled; a police officer may be evaluated by number of tickets written; or a car salesman may be evaluated by number of cars sold. On the surface, these criteria seem very reasonable. However, as Borman points out, there are several reasons why objective criteria often do not accurately reflect someone’s true performance on the job. First, objective criteria may only reflect a small part of one’s job (e.g. the number of tickets written by police officer). Second, when using objective criteria, someone’s performance is often dependent on factors that are outside of his/her control (e.g. production worker is dependent on many others when assembling products). Finally, the numbers obtained from objective criteria might be difficult to evaluate. For example, a car salesman at one store might sell the same number of cars as a salesman at another store, but the market for cars at these stores could be very different. Ultimately, when using objective criteria as a performance measure, you need to diligently research how these measures are obtained in order to ensure that the information truly reflects the person’s performance. When collecting performance ratings, the supervisor is often considered to be the person who is in the best position to make these evaluations. However, there is often value in collecting ratings from sources in addition to the supervisor. As many jobs are complex in nature and include working with people at all levels of an organization, ratings from sources such as peers, subordinates, customers, etc. 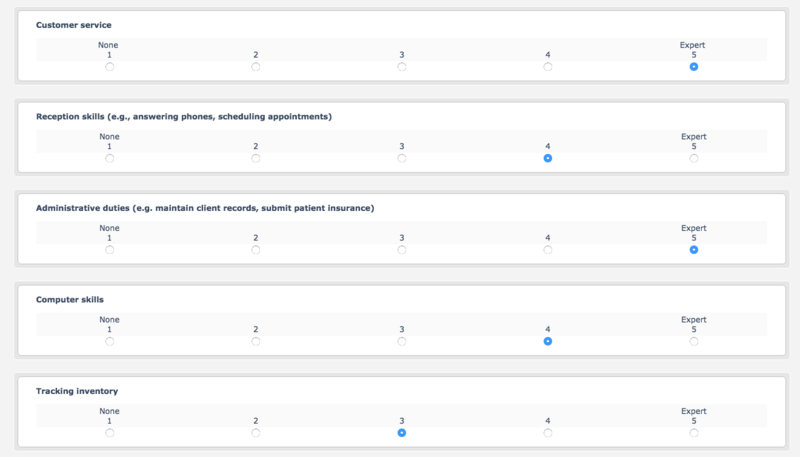 might capture information about someone’s performance that isn’t reflected in supervisor-only evaluations. By collecting ratings from multiple perspectives, a more comprehensive portrayal of employee performance can be obtained. Clearly, there are many issues to consider when collecting performance information. While the purpose of this article was to introduce some of the most common issues that we often wrestle with, we realize that each organization and each job has its own factors that need to be considered. As such, we realize that there is no perfect measure of how someone is performing, which in turn can make it difficult to determine who is a “good” hire. What we do know, through experience, is that following best practices for collecting performance ratings can greatly enhance the accuracy of this information. Scott specializes in developing and implementing assessment programs to help organizations select and develop their workforce. With over 15 years of experience as an I/O Psychologist, Scott partners with clients to identify talent-related problems and design solutions to enhance the skill level in their organizations. This article appeared originally at https://www.marketingdepartmentinc.com/5-winning-steps-business-part-1/. We have written successful strategic plans for start-ups, small businesses, nonprofits, banks, downtowns and entire communities. Over the past 20 years of facilitating this process, I learned what works and what definitely doesn’t work and I want to share this with you now. Why a strategic plan? This is the single most important asset to any organization. Without purpose and direction, your company will not win. Who should facilitate the strategic planning process? Strategic planning can be an emotional process, with personal agendas filled with assumptions, especially if you’re going through this process for the first time or haven’t updated your plan in a while. 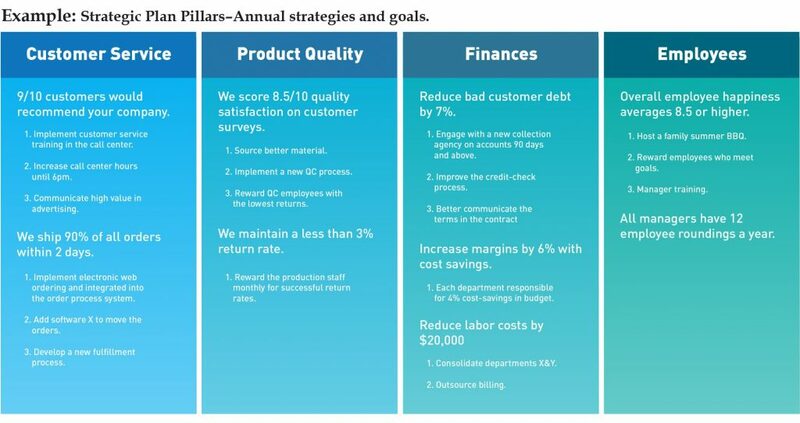 If this is your first strategic plan, seriously consider having someone outside of your organization facilitate the process. If you’re updating your strategic plan, chances are someone working in the company who is organized, diplomatic and neutral will do a good job. If not, call a pro. Great Lakes Center for Youth Development in Marquette has experienced professionals on staff who facilitate strategic planning for nonprofits and small community groups. You should also talk to them about grants! Denise Hansen, Michigan Small Business Development Center also does a great job at facilitating the process for small business and nonprofits. SBDC services are provided at no charge through the State of Michigan. Strategic Planning – Let’s get started. A great strategic plan acts as the roadmap for how the entire organization will reach its final destination – your vision. It outlines strategies and prioritizes activities for finances, operations, facilities and of course, sales and marketing. Once you and your team are clear on these points, you are ready to begin! Stay tuned next week for how to start writing your strategic plan. This article appeared originally at https://www.stangds.com/blog/job-candidates-journey-sds-application-process/. As most of us know, the job search and application process is not always fun nor easy. However, there are ways to make the process more efficient to save both the applicant’s time as well as the employer’s. One way to do this is to create an application that is split into several steps, and the process ends if the candidate is disqualified following any of those steps. This way, the candidate’s time isn’t wasted going through unnecessary steps if it is already determined that they are not qualified. Another way is making the applicant assessment as accurate and specific to the job as possible so that, ultimately, the best-fitting applicant can be hired and have a better chance at succeeding in their new role. As an employer, you may be wondering what our application process is like from the candidate’s perspective. In this article we will walk you through what it’s like to apply for a job through Stang Decision Systems’ hiring process. When a new job is created in the SDS HireScore Talent Portal, that job is posted to your company’s own custom SDS job board, to JobOdds.com (our proprietary job board), and over 100 of the most popular job boards. The applicant sees the job posting on one of these sites, where they can then click the posting to get details about the job and apply. 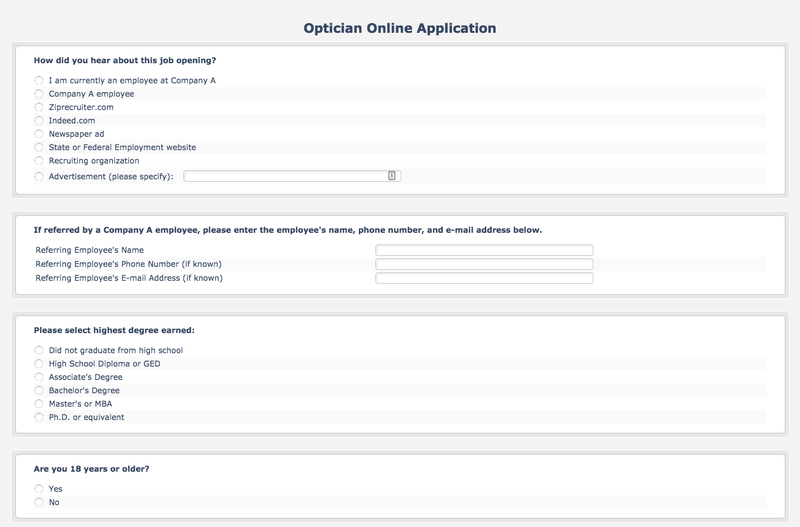 Once the applicant clicks through to the job application, they are greeted with a page asking the most basic questions for that particular job. These include questions concerning their highest degree earned, right to work in the U.S., and specific base skills required for the job. The skill-related questions will require the applicant to answer on a scale of 1 to 5, with 5 meaning “Expert” and 1 meaning “No expertise in this area.” This helps quickly determine the applicant’s proficiencies in several key areas. If the applicant passes this first portion of the of the job application, they move on to the Employment Application Form, which asks more detailed information about the applicant–including their education, work experience, and contact information. 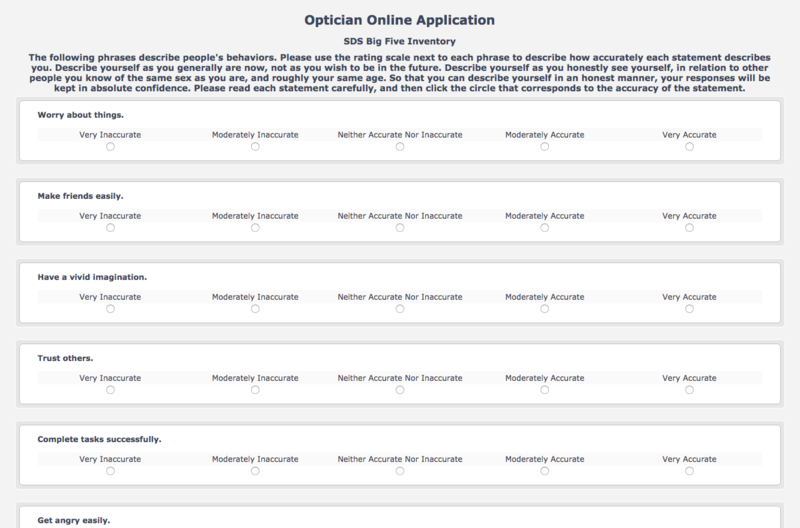 The applicant then continues on to the SDS Big Five Inventory, which measures the applicants’ behaviors in five specific areas: openness to experience, conscientiousness, extraversion, agreeableness, and neuroticism. Although this is a relatively short assessment (it takes about 20 minutes to complete), it yields powerful results to help paint a complete picture of the applicant’s behavioral traits as they relate to a specific job. Following the Big Five Inventory, the applicant will be taken to the final part of the application–the Situational Judgement Test–where they are asked a series of questions that put them into dealing with real-life scenarios for that particular job, and asks how they would respond. These questions gauge the applicant’s common sense problem solving and cultural fit as well as their competency in their particular field. 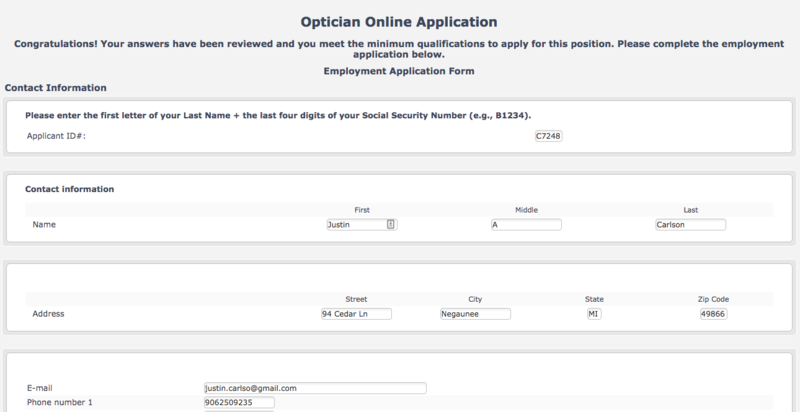 Following the completion of this application, the applicant’s HireScore will be generated and ranked with the other applicants for this position. This score is determined by a customized, job-specific algorithm that weighs the values from this application against the optimal values for that particular job. The employer can then contact the top-ranking applicants and continue the hiring process. The application was straightforward and easy to understand. It was organized in a logical manner and did not ask any questions that felt out of place or too personal. The Big Five Inventory personality assessment contained short and simple questions, but it was clear that the number of questions combined with their specificity would accurately reveal significant negative (or positive) personality traits. 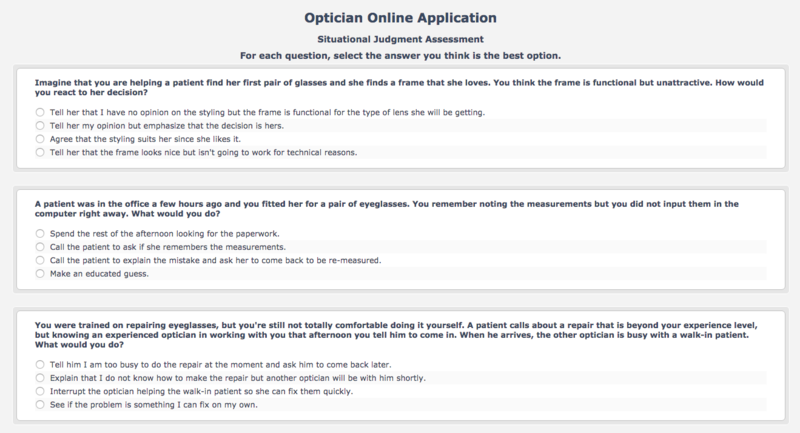 The Situational Judgement Test for this application (in this case for an optometrist position) asked questions that seemed to have relatively obvious answers, but also questions that were more difficult and required specific knowledge–such as converting eyeglass prescription values from one format to another. So there you have it. The SDS application process itself might not be entirely different from some of the other processes out there, but the customized and specific questions combined with the knowledge that the values from this assessment are weighed against the optimal values for this job and then combined to produce a single comprehensive score gave the feeling that this was a fair and accurate process that minimizes human bias. And this certainly would increase the confidence in the system for both applicants and employers alike.